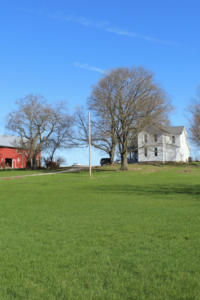 When we bought our farmhouse, most would have thought we were crazy. 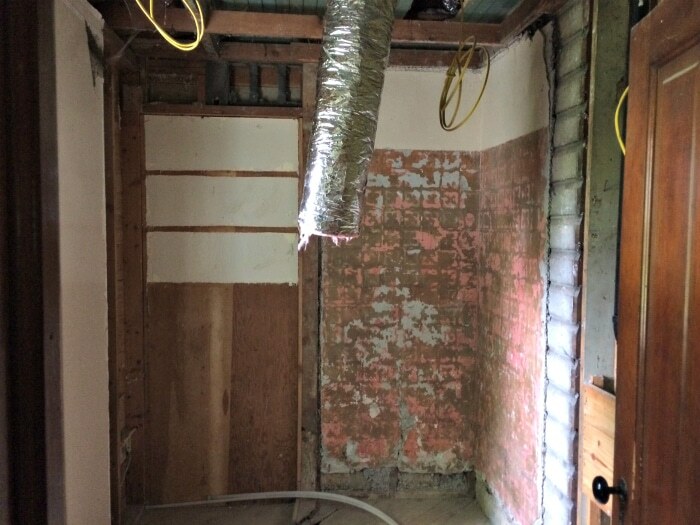 Looking at our bathroom renovation and the before and after pictures, I can see why. The carpet was probably enough to make anyone think they should run. However, with lots of planning and patience, we now have a beautiful space. It’s exciting to buy a house and then create the home that fits your style. And while a renovation project is a lot of work, the reward is truly worth it. I thought it was time I did an update on our bathroom, to give you the full before and after tour. 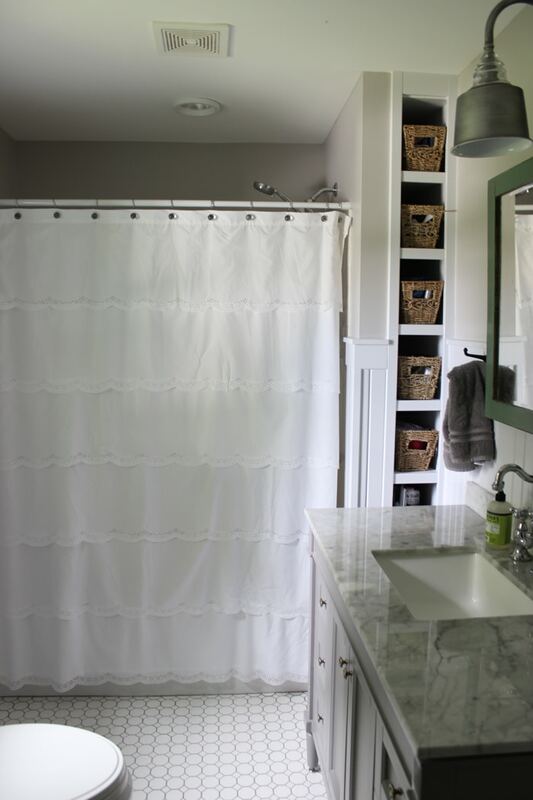 Since we only have one full bathroom, we wanted it to be practical but also beautiful. Fitting the time period of the farmhouse was also a priority. 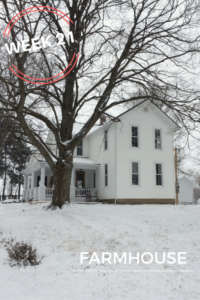 Of course, the home was built in the 1860’s with no bathroom – but you get the idea. 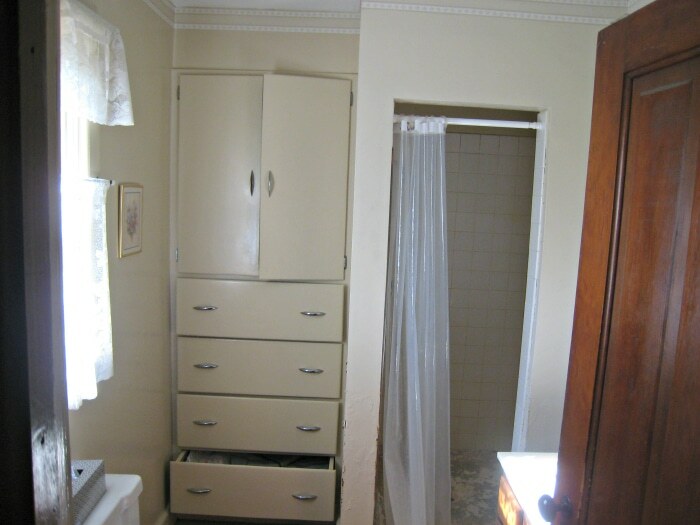 When we bought the home, this is what the bathroom looked like. 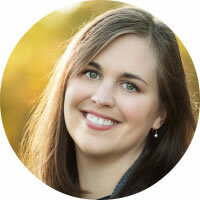 The shower was solid concrete, the carpet on the floor smelled – and the space felt tight. I did love the built ins, but that was about all. Unfortunately, since the home had not been cared for the dated space became – for lack of better words – gross. If you followed along on our farmhouse renovation adventures last year, you know that this space turned out beautifully. 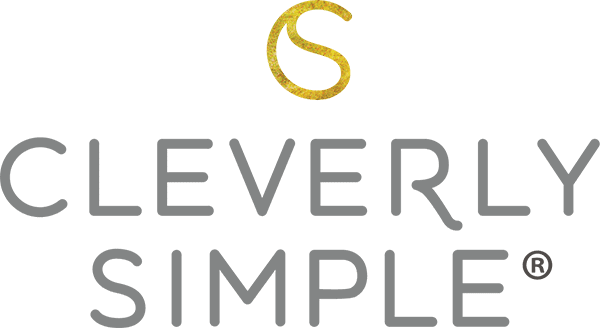 We hired a contractor to do most of the work in our home – but coming up with all the design choices was my task. Originally, the bathroom had been a porch. You can see the remains of the porch ceiling and some of the detail on the wall. I was hoping to keep the ceiling, but it didn’t carry through the entire space. We also needed to run electricity for lights. Important. And just like that it was brighter! 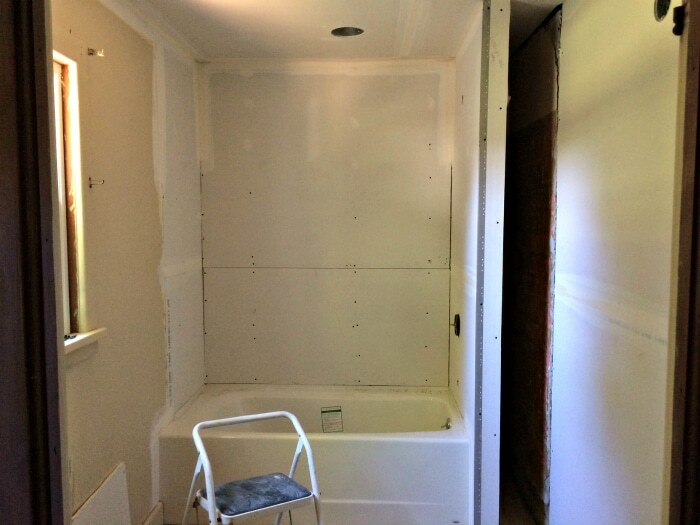 We drywalled over the exterior siding. 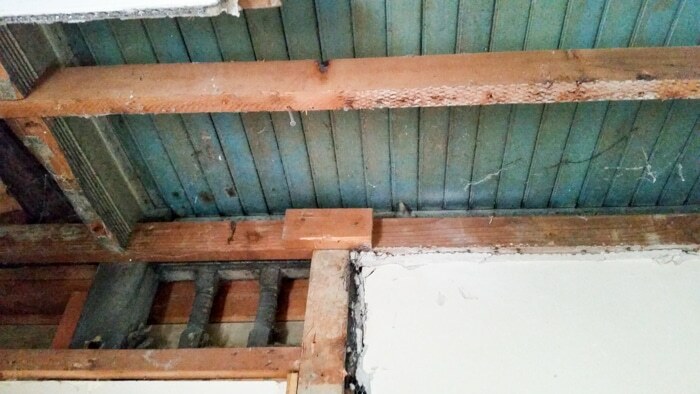 I wanted to keep it, but alas there was a doorway (to the original porch) that left a big gap in the wall of siding. We also installed a large cast iron tub that looked “old fashioned”. 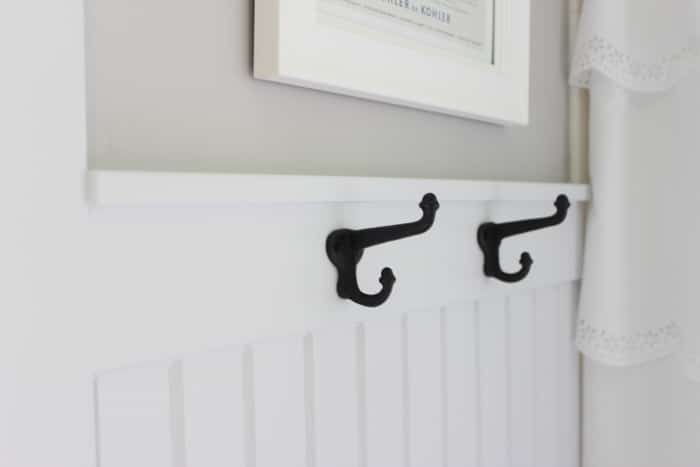 To add to the period of the home, we put a bead board type 2/3 moulding. It gave it a defined look. You can see above before everything was painted, how yellow the old window sill was. That is the only painted wood in the home (thankfully) and it got a fresh coat of paint as well. The flooring is a simple hexagon pattern we ordered from Menards. 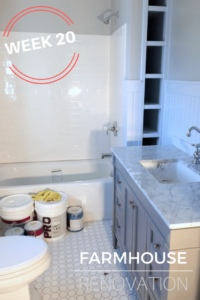 I picked a darker grout for two reasons. One, I think it makes the space have more pattern to it. Two, we have one bathroom and two very active boys – it doesn’t show as much dirt. After the basics were done – the fun part came! Making a house a home involves picking out the details that define your style. Buying our home was a long process. It was a sentimental purchase but it was also a large financial decision for our family. The stress of all the mortgage paperwork, contractor appointments, budgeting and trips to the property were all worth it at this point. Now, we had the chance to make this our home. We wanted it to honor our family who had lived here before us but also our family style. 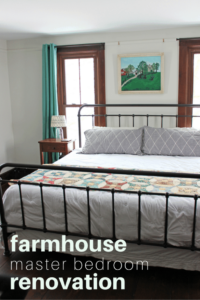 Since we have a farmhouse I wanted things that were a fit for the time period it was built (as much as possible) and also wanted design that was classic since we are never moving. We decided on a gray vanity that we ordered online. It is 48 inches wide which is large for the space but we needed the storage. 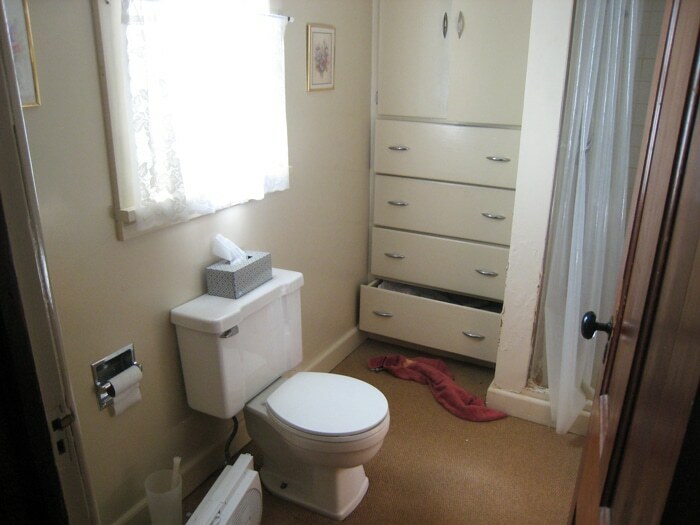 The vanity gave us 6 drawers and large middle doors for towels. It also came with a marble countertop and sink. Love it! 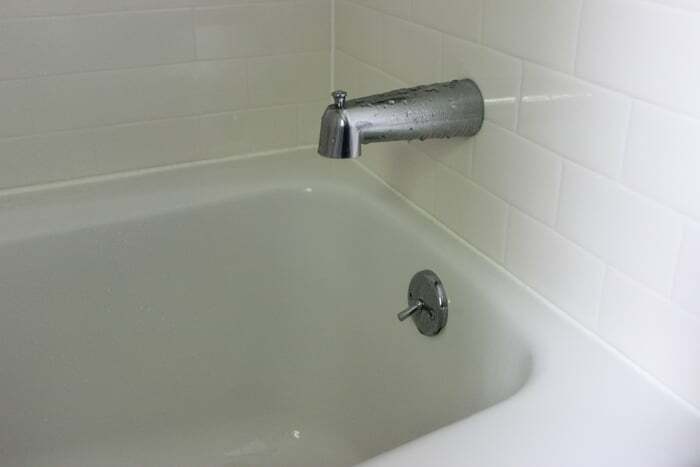 But probably the highlight of the room, is the faucet. 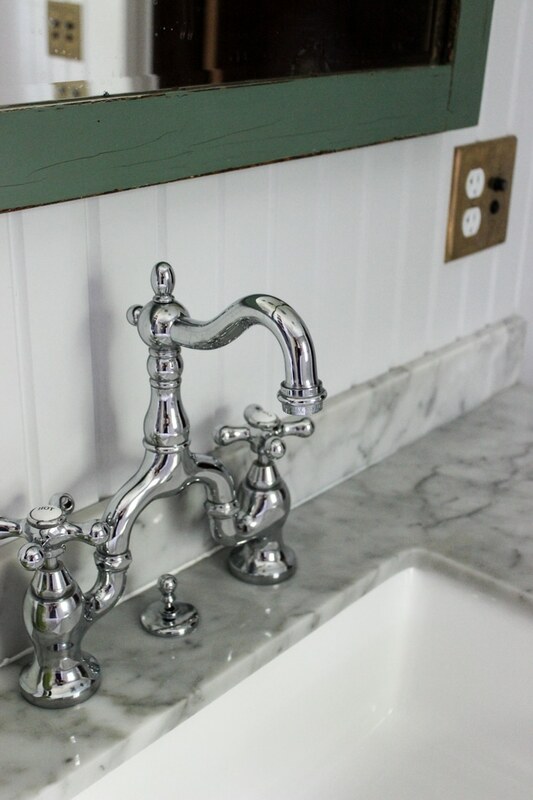 We purchased a bridge sink to make the space look old and I love, love, love it! Probably one of our most unique purchases was the surround to the cast iron tub. 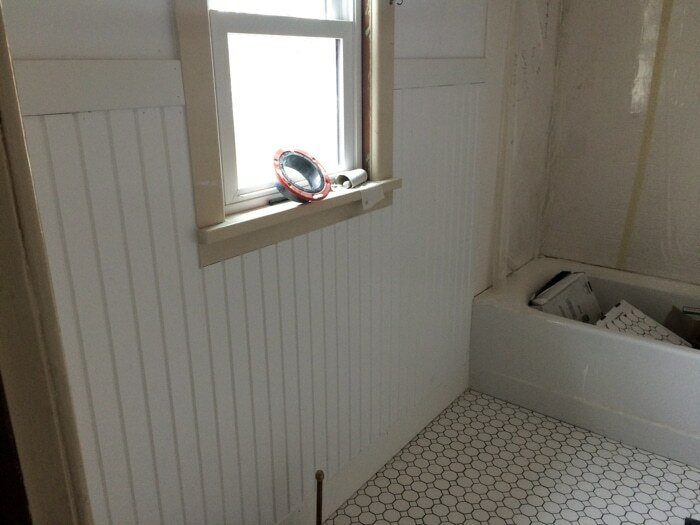 I wanted the look of subway tile, but I did not want the hassle of cleaning grout. Remember, the two very active – and messy – boys in our household. We found this surround made of pressed marble. 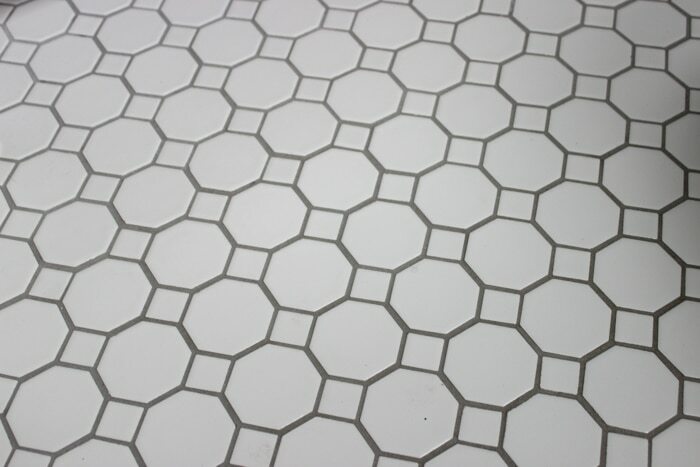 It gives us the look of tile, without the hassle of the grout. It is a dream to clean. Seriously, it could not be better. Here’s another look at the moulding when it’s all painted. So pretty! 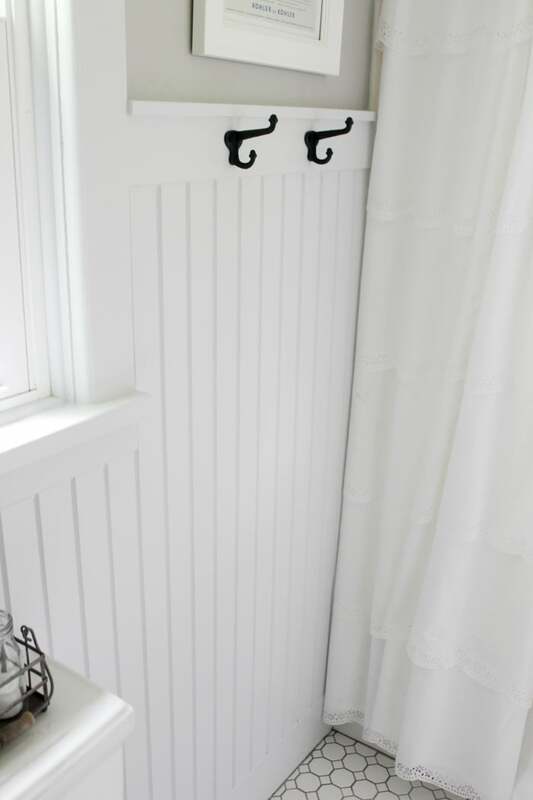 We purchased old fashioned hooks to hang our towels. They are practical and they look great. Win. Win. The light fixture was a tough one. 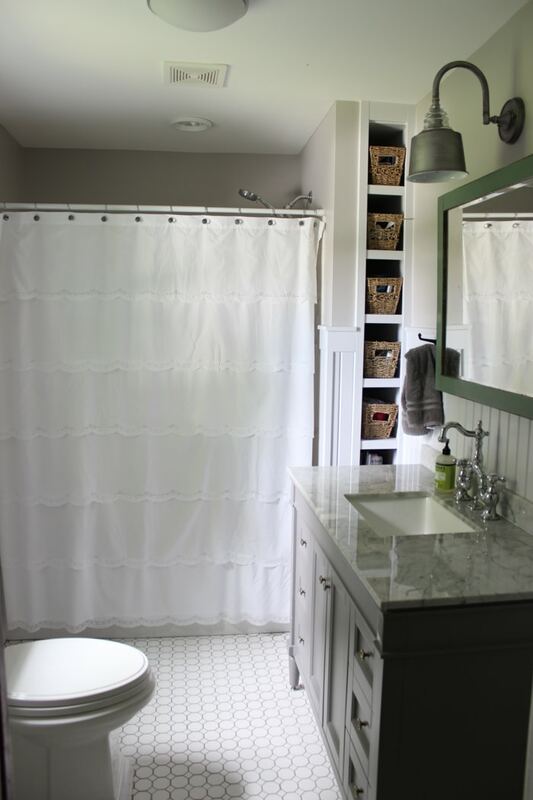 I didn’t know whether to go with one light fixture above the mirror or two on each side of it. Keep in mind, at this point I had no idea what mirror I was going to purchase. 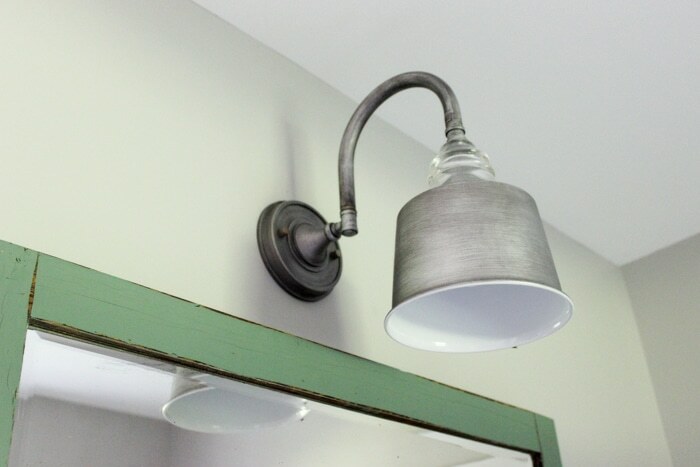 I decided to go with a barn light and I think it looks great in the space. 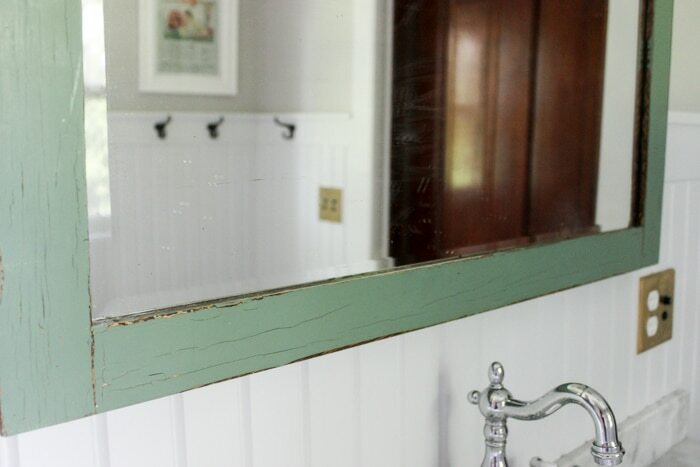 I looked for months for a great mirror – only to decide on using one from the home. This mirror had been in my grandma’s master bedroom. It’s the green that we found between the layers of the wallpaper, on the furniture, everywhere. While most of the green is gone, we now have a touch of it in our bathroom. I had thought about stripping it and staining it dark like the door, but I think I’m going to keep it green. What do you think? 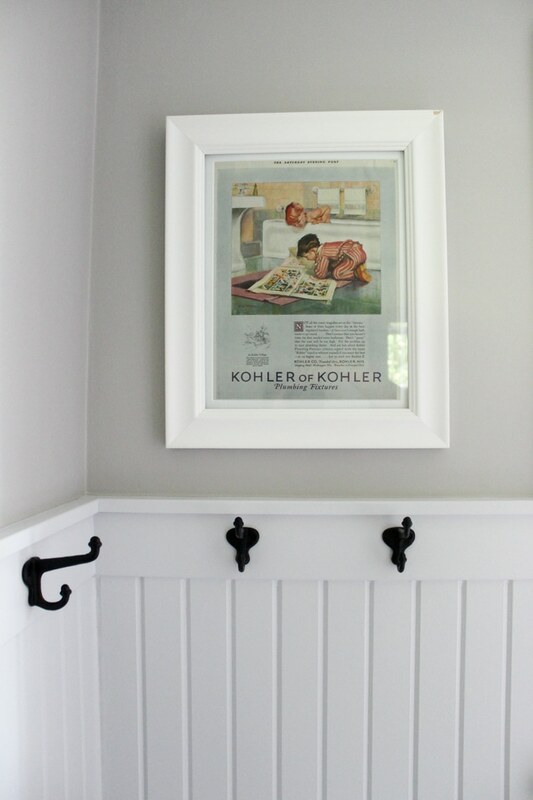 Lastly, we put the 1920’s Kohler ads I had purchased and framed in the space. I love them and the color they give. Speaking of color, the walls of our bathroom are the only walls that received a paint color in our entire house. 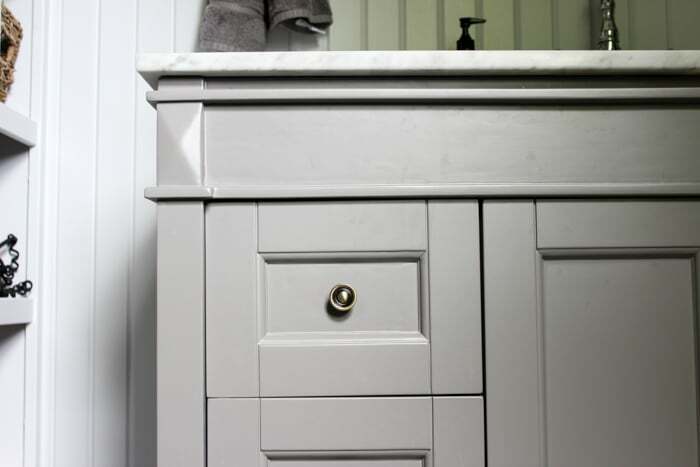 If you want to call gray a paint color. The rest of our home is an off white. Adding details like the pictures, the mirror and the hooks really make this feel like our home. I can’t believe how far we’ve come. Looking at the before pictures, I don’t even recognize the space! Lynette, great post. You never know what you will find in these old farmhouse. Thanks for sharing the pics of the old porch. Finished bathroom looks beautiful!